Image by Jen Mayfield. Copy by Jessica Cross. TDC’s Facebook ad preview. I’m not naturally a leap-before-you-look kind of gal. 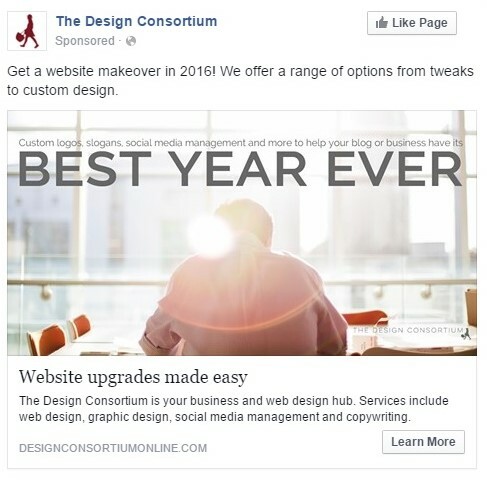 And creating my first Facebook ad for The Design Consortium, where I write copy and analyze websites, was no exception. I knew I could write the copy according to Facebook’s character length specifications for our particular ad objective. What unnerved me was the process of setting up the ad. Fortunately, I had TDC team depending on me to get it done–that’s the cure! I learned that the process of creating a Facebook ad, though detailed, is easy. While I’m unable to write about our target audience, I’m going to walk you through what to expect when creating your first Facebook ad. Keep reading for a roundup of tutorials to get you started. Of course, what would a blog post about Facebook ads be without a shameless plug for TDC’s services? If concise copy and graphic design aren’t your thing, we can help. Be fully ready to press the “create” button when you begin creating your ad, if possible. Facebook is bad about streamlining saving your work as you go. Since our ad was a team project, we collaborated on each piece, which meant pausing often to get a consensus. I started the ad, unexpectedly having to return to it to finish it later, and having to reenter data each time I returned. Be as organized as possible before creating your ad. This will save you from having to reenter ad details, which isn’t the end of the world, but is a hassle. Start with a goal in mind. Do you want your ad to lead to more sales? Do you want your Facebook page to grow? Think about what you want the ad to accomplish before you begin. Thankfully, our website guru and TDC owner, Ginny was standing by to insert the code. Whew! Know your peak times. Facebook offers a wide range of ad targeting options, including full control over when your target audience will see your ad. Danyell, our social media guru got us started by identifying our followers’ peak activity times on Facebook. I set our ad to run during peak times, which basically correspond with Monday through Wednesday from 10 a.m. to 9 p.m. and Thursday through Sunday from 7 p.m. to 9 p.m.
Target your audience carefully. Know all you can about your existing audience or about the audience you want to reach. Many marketers advise targeting people similar to your existing audience or customer base. This way, people who are the most likely to be interested in what you’re offering will see your ad. We took this approach, rather than testing a new potential audience. You can also exclude an audience from seeing your ad. This is useful if you want to narrow your reach to exclude existing customers who use your products anyway. As you’re setting your audience, pay close attention to differences among demographics, behaviors and other categories. For instance, if you want to target “small businesses,” know that there is a difference between people who have liked pages related to small businesses and people who have made purchases related to small businesses. But Facebook makes choosing audience details easy for you. If you hover over a selected audience category, Facebook identifies the number of people in that audience and the definition of that audience. Narrow your audience if needed. The social network gives you a gauge at the top right-hand corner of your audience setup page. This lets you know whether you need to widen or narrow your audience. Facebook also tells you the size of your potential audience. As we were going through this process, I had to learn where to start. Below is a roundup of some of the tutorials I found helpful in the process. A step-by-step guide for creating your first Facebook ad. A similar overview of Facebook ad creation, though less detailed. Facebook Blueprint, a learning center for ad creation. How much do Facebook ads cost? Plus, pitfalls to avoid when creating your ad. The basics–five things to think about when advertising with Facebook. You’ve created your ad. Now what? Measuring the success of your Facebook ad.